By Dirgha Raj Prasai : Hindus are devoting the lord Shiva on the occasion of ‘Sivaratri’–2070. In this year, Sivaratri is celebrating especially, Nepal and India and in all over the Siva temples in the world. According to the Hindu Mythology, Lord Shiva (Pashupatinath) spent his most of his time on the top of the holy mount Kailas Mansharobar, practicing Yogic austere, joy and love with his divine consort Parbati (mother of mythology), The Lake Mansarowers and the holy mount Kailas are the soul of all ‘OM’ followers in the world. The Lord Pashupathinath, Shoyambhunath, Lumbini, Barahachetra, Gosaikunda, Muktinath, Ridi, Janakidham, Devghat of Nepal, Kailash Mansharobar of Tibet (well accessed for Hindus and Buddhas), and Tirupati, Rameshroram, Jagannath, Badrinath, Amarnath, Kedarnath of India are the symbolic shrines of Hinduism & Buddhism. ‘Doleswar Mahadev (lord Shiv) (Shipadol-Bhaktapur-Nepal) is the head portion of the Kedarnath (lord Shiv). The Lord Shiva is believed to be at the core of the centrifugal force of the universe. Unlike Brahma, the Creator, or Vishnu, the Preserver, Shiva is the dissolving force in life. But Shiva dissolves in order to create, since death is the medium for rebirth into a new life. So the opposites of life and death and that of creation and destruction both reside in Him. Shiva, represented as the symbol of the eternal process of creation and destruction, is absolutely independent and creates all that exists under the influence of desire by the mere force of HIS WILL (Iccha Shakti). He makes the world appear in Himself as if it were distinct from Himself, though it is not so in reality. Shiv Puran also mentions It.’-(Shree 1008 Jagat Guru Bheemashankarling Shivacharya). Similarly, the Swayambhunath complex consists of a stupa, a variety of shrines and temples, some dating back to the Licchavi period. A Tibetan monastery, museum and library are more recent additions. The stupa has Buddha’s eyes and eyebrows painted on. Between them, there is something painted which looks the nose – but is the Nepali symbol of ‘unity’. Pashupathinath, Shoyambhunath both are Hindus and Buddhists shrine place. There are some very early Buddhist sculptures here. A lingam, now lost, was named Karunikeswar, another name of the Buddha. Nepal is known pious land in the world. Hindu philosophy and its culture and tradition are the founder of world civilization. Hindu shrine Pashupatinath (Shiva) is the Lord of all Hindus. According to Hindu mythology, Shiva is worshipped as protector of all animals, including humans. The Nepalese and Indian Hindu men and women perform rituals for the Hindu god Lord Shiva- the god of destruction and creation. In Sivaratri, Axyatritiya, Janaipurnima, Tij and Sawan Mondays are most remarkable times in every year. The Sawan Mondays is considered as the holiest month of the year. In the time of Sawan the Hindu men and women wearing red attire as well as green and yellow bangles. They pray for their own country’s peace and stability and the long and prosperous life for their husbands, sons-daughters and families. The young pray to achieve the good husband and wife. ‘Shiva is every where, he has left work for you, you have to work without expectation. ‘Shivaratri is celebrated with enthusiasm by the Hindus all over India. It is an important day for the followers of Lord Shiva. The celebrations are marked by fasting and the observance of a number of rituals. On the festival, as many as six types of Abhisheks (purifying) can be witnessed, each using milk, ghee, sugar, honey, water and sandalwood paste. We pray to the Lord Shiva, as – “OM! Namo Sivaya ! O Shiva! We worship and adore you, O three-eyed one, you are sweet gladness, the fragrance of life, which nourishes us, restores our health, and causes us to thrive. As, in due time, the stem of the cucumber weakens, and the gourd is freed from the vine, so free us from attachment and death, and do not withhold immortality.” The devotees of Lord keep reciting the five letters-‘Om Nama Shivaya’ followed by occasional singing of Vajanas-hymns, reading and listing to stories and episodes on Shivamahatmyas and by worshiping the Shivalinga. A scholar Upananda Brahmachari explains- (Hindu Existence July 14, 2012) ‘As per Hindu realization (one may degenerate it by calling it Hindu mythology) with a subtle scientific approach, Lord Shiva (Nataraja) is described as Devadideva, the primordial god of all gods, the supreme creator and the Mahadeva, the greatest god, the supreme source of energy. Shiva is the cosmic dancer who performs his divine dance to destroy a weary universe and make preparations for god Brahma to start the process of creation afresh. This new creation is harmonized and preserved by god Vishnu, obviously by the force of trinity in the singularized and unique entity originated from that Devadideva or Mahadeva. Lord Shiva, the Grand Designer. Lord Mahakal. Shiva is dancing in an aureole of flames with a rhythm of time infinite so beautifully, lifting his left leg and balancing over a demon or dwarf (Apasmara) who symbolizes ignorance and evils. OM! Namah Shiva. It means adorn all endeavors in the light of truth, prosperity and maturity’. The festival of Shivaratri has tremendous significance in Hinduism. According to sacred scriptures, ritual worship of Lord Shiva on Shivratri festival that falls on the 14th day of the dark fortnight in the month of Phalgun (Feb.) pleases Lord Shiva the most. This fact is said to have been declared by Lord Shiva himself, when his consort the Goddess-Parvati asked him as to which ritual performed by his devotees pleases him the most. Even till date, devotees of Lord Shiva perform the ritual worship of Shivratri with care and devotion. They observe day and nigh fast and give sacred bath to Shiva-Linga with honey, milk, water etc. Hindus consider it extremely auspicious to worship Lord Shiva on a Shivaratri as it is believed that worship of Lord Shiva with devotion and sincerity absolves a devotee of past sins. The devotee reaches the abode of Lord Shanker and lives there happily. It is said that Lord Shiva is an avid dancer to, as one of the superb type of oriental dances. The Lord is always engaged in meditation, Shiva is also NATARAJ, the cosmic dancer who graphically expresses the rhythmic unity of life. His representation as the Shivalinga symbolizes at its simplest His creative and generative powers. Being of an elliptical shape, the Lingam denotes something which has neither beginning nor an end. It is mysterious to express that rainfall flows automatically in Shivaratri almost Feb.-March, similarly, in Mekh Sankranti (Baisak 1st) almost April,14-15, Srawan Sankranti 17th July and Makar Sankranti almost 15th Jan. The Sivaratri (Day of Lord Shiva) is also is countable event in Hindu festival. In these days- there is natural gift where rainfall flows. The Mahashivaratri-festival is observed with great devotion by all the Hindus in the world. ‘Shivaratri is a festival of great significance for Hindus all over the globe. Literally meaning Shiva’s night, it represents the high state of spiritual realization when the world of relativity fades away and perfect peace and calm prevails. On this phenomenal night, the seeker remains fully aware of his identity with Shiva, the source of perennial joy and thus experiences eternal truth, bliss and lasting beauty-Satyam, Shivam, Sundaram. Esoterically, it is the most sacred moment of the union of Jiva, individual soul, and Paramatma, the Supreme Godhead. '(United Hindu front) The Lord Pashupatinath Temple sits on a sacred river on the edge of Bagmati, Kathmandu. The Bagmati River which runs next to Pashupatinath Temple has highly sacred properties. Thus the banks are lined with many Ghats for use by pilgrims. The Bagmati River is a river of Nepal its flows through the Kathmandu valley and is the river separating Kathmandu from Lalitpur. It is considered a holy river both by Hindus and Buddhists. A number of Hindu temples are located on the banks of this river. The complex rises up from the bank amid a mass of pagoda- style buildings. The temple moves to ancient rhythms. And one of its many traditions has been to recruit its priests from Brahmins from far-away south India. But, for the first time, the south Indians have been replaced by local, Nepali Maoist priests. It used to be that the temple authorities would appoint its priests in conjunction with the king- and he was always happy to maintain the link with south India. The fiercely secular communists would have few qualms about dispensing with the services of the south Indian Brahmins. Nepalese Maoists have tried to destroy the identity of Pashupatinath, Living Goddess Kumari, Bikram Sambat and its calendar and every norm of Hindus. In 2008, the Maoists had appointed their own people. We Nepalese people are worried that Pashupati complex is being used as a playground for politics.The Bhandaris are the traditional temple caretakers, including Nepalese nationalists the Bhandaris also protested against the decision of Maosts. The temple decision has led to demonstrations by Hindu groups. Nepal’s Supreme Court directed the temple authorities to clarify the controversy and not to let the newly appointed Nepali priests perform the rituals. The Supreme Court has ordered the trust to allow the three Indian priests to carry on with the rituals till its verdict.Traditionally; the temple authorities would appoint its priests in conjunction with the king. Now, since Sep.1st 2009 two priests had beaten by Maoists into the compound of Pashupatinath. The priests were badly injured. Since 300 hundred years, the priests are devoting in Pashupatinath as a pure Hindu but not as Indian. The tradition has been already establishing. Then, who can ovoid the cultural traditions? Cultural traditions can’t change by the political Party and constitution. But, now, that was a simple thing for Maoists to beat and thrash. A group of Maoists were active to disturb and abolish the Hindus cultural assets. The priest- Girish Bhatta and Raghavendra Bhatta, are not the problem, but that is the issues of abolishing the Hindu Monarch & Hindu Kingdom from Nepal. Hindus & Buddhists are feeling, without Nepalese monarchy, the culture and Dams, Temples of Nepal and India can’t save. In 1746 AD Pratap Malla the King of Kathmandu came in touch of Kartatac King and appointed Gyanananda & Lambakarna as priests of Pashupatinath. They were Tantrik (having mystic power). Till now, there are four Bhatta priests & 106 Newars as Bhandaris (store keepers & protectors) Bhandaris are chronologically important. 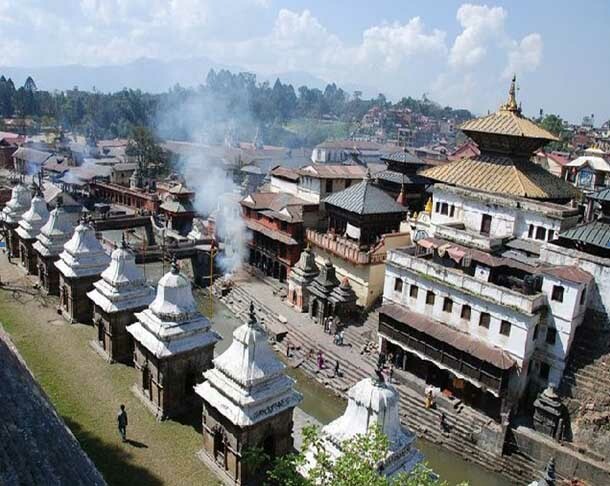 Only those born in Devpatan, the Pashupati area are entitled for worshiping lord Pashupatinath. Bhandaris are the owners of their houses. Since 9th Apr. 2012 the priests- Bhatta and Bandari in Pashupatinath is starting to get a fixed salary. Pashupatinath’s area is regarded as one of the most important places of pilgrimages for the followers of Hinduism. Thousands of devotees from within and outside the country come to pay homage to Pashupatinath every day. And on special occasions like Ekadasi, Sankranti, Mahashivratri, Teej Akshaya, Rakshabandhan, Grahana (eclipse), Poornima (Full moon day) the whole atmosphere turns festive and mirthful as people congregate here in a far greater number. During the Shivaratri (also spelled Shivratri) festival Pashupatinath temple is lit with ghee lamps throughout the night and the temple remains open all night. Thousands of devotees take ritual baths in the Bagmati River on the day of the festival and observe a fast for the whole day. Hundreds of Sadhus (sages) from different parts of Nepal and India come here on the occasion of Maha Shivaratri. Just 2011, 2nd Feb. in the evening, King Gyanendra Shah and former Queen Komal guarded by security forces reached the temple. At that time, the supporter of monarchy and Hindu Kingdom had heartiest welcomed? All the Nepalese nationalists and royalists chanted monarchy slogans there. The area of Pashupatinath imcompasses 264 hectre of land including 518 temples and monuments. We want to protect and safeguard the heritage. The Rajbhandaris must be reinstated. The decision done by Maoist must be scraped out. Maoist followed the villainous part as played by Samasuddin from Bangal having a force of thirty one thousand Muslims plundering and vandalized the faith and trust of Hindu & Buddhist in Bikram Era 1400. The last Licchivi regime was very weak. There was a great chaos after the Muslims attack. To save the regime from such a dreadful situation Jayasthiti Malla, the Ksha King having cooperation and assistance from kings of Palpa, Kaski, Gorkha and Lamjung, attacked vigorously on Muslim army. Thirty thousand and four hundred soldiers were killed and almost six hundred fled away. It is carved and can be seen in Bhatapur Taleju temple. Then, Jayasthiti Malla ascended the throne of Kathmandu and reconstructed the temple and constructed the Rama temple across the Bagmati river and established Kumbheshwar Mahadev and performed Kotihom (oblation for one Crore over the sacred fire) Believers in Pashupatinath (mainly Hindus) are allowed to enter the temple premises but non-Hindu visitors are allowed to view the temple from the across the bank of Bagmati river. Due to the attack of anti-Hindu Jayasthiti Malla laid the strict rule regarding the entrance for the Hindus & Buddhists only. This is inviolable. But, now the Bagmati River is dirty and can be smelled well before it comes into sight. So, at any rate, it should be non-dirty. Since 2011, the artificial problem has created to minimize the pious land by Christians. It is wrong for Christians to use the Sleshmantak Forest to dispose of their dead. As a member of the Nath Yogi Community have been burring there. In this context- Rampuria Baba, a sage from Maharashtra (India), said-‘Pashupatinath is our holy place. Why would Christians build their graves here? We should throw them out and remove all the stones.’ The secretary of the Pashupati Area Development Trust (PADT)- Sushi Nahata also said- ‘We have had to ban non-Hindu cremation and burials to uphold UNESCO rules.’ As the Nepali society is passing through the so-called ‘transitional phase. We, the Hindus al over the world have the courage to call spade a spade. In this context, the Christian community protested demanding burial grounds in the country, already threatened local religious communities with the increasing activities of Christians since the declaration of the country as a secular state, has too become restive. To protect Nepal’s unique identity the country must be declared Hindu Kingdom. We, the Hindus are not targeting any religious group as such; it is in the larger interest of the nation and people. To preserve Nepal’s unique identity, our nationalism and territorial integrity we never surrender to protest who are interested to destroy the identity and prestige of the Hindus in the world. King Jyotirmalla writes in stone tablets- ‘about Pashupatinath in 1465 Bs, lord Pashupatinath having five mouths along with worship able Bashuki the holy serpent. King Pratap Malla was famous in stone tablets. Prithvinarayan shah the great, worshipped lord Pashupatinath duing his integration of Kingdom. It is stated in Lingua Bambshabali. Prithbinarayan Shah had got carved in Basantapur Place in 1826 Bs after his Victory over Kathmandu valley-‘ Lord Pashupatinath & Goddess Guheshwari may bless Nepal for keeping sovereignty and stability along with Shah popular Regime. Royal seals were attached regarding the worship of Lord Pashupatinath by King Ranabahadur Shah, King Mahendra, King Birendra and King Gyanendra as well. Since 1979 Unesco has kept this core area as a world heritage. It encompasses four hector of land as a very sensitive area. Let this government be away from imposing political interference over Hindus & Buddhists. The decision done in contravention of all the rules & the regulations regarding the Pashupatinath worship is scraped immediately. Without monarchy, Nepal and its religious culture and tradition can’t save. So, for the sake of Nepal and Indian security and the identity of Hinduism Nepal must be declared Hindu nation with the Crown Hindu monarchy. .